A Record-Breaking 298,451.65 UK Pounds Progressive Blackjack Jackpot Was Hit At William Hill Casino. Player Pet200710 won large £298,451.65 jackpot while playing Progressive Blackjack in William Hill online casino on January 7th, 2005. Progressive Blackjack is a Cryptologic game where for a fixed $1 side bet players allowed a chance to win a minimum progressive jackpot of 50,000 credits. InterCasino Player Kolle70 Hits Huge Progressive Blackjack Jackpot Of Over $240K. Kolle70 had been playing Single-Player Progressive Blackjack at InterCasino when he hit this one of the largest online blackjack jackpot of $240,370.67 on December 16th, 2006. His extra $1 investment per hand turned into this huge progressive jackpot win. Congratulations! Striking 7s Blackjack Delivers $161,640 Jackpot To Slotland's Player. 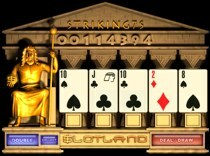 May ended up being quite a profitable month for many online players at Slotland online casino, especially for BOUNCIN, who recently scooped a whopping $161,640 progressive jackpot while playing Striking 7s blackjack game on May 23. This is the 3rd big progressive jackpot winner of the year at Slotland. The casino plan to see quite a few more online jackpot winners before the end of the year. Note that the progressive jackpot is currently standing at over $114,000 level and growing. Bodog Online Casino Player Tim L. Strikes Blackjack Gold With His Big Win. Tim L. struck gold playing online blackjack at Bodog online casino by hitting a staggering $30,700 jackpot on Sunday. Actually, this weekend brought a lot of money to the deserved Bodog's players as they win 10's of thousand bucks playing online blackjack at the casino. Other biggest winners include Kyle B. from California with his cool $16,503 win and Morgan M. who won $17,030 playing blackjack. Bodog online casino ofersa total of over 70 RTG games.